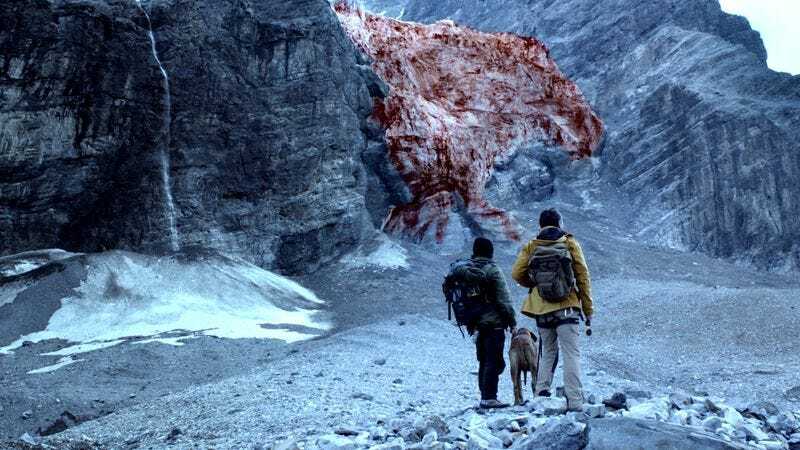 In an era of predictably tweaked horror premises and haunted-house flicks with 10-dollar titles, a doggedly straightforward monster movie like Blood Glacier can feel refreshing, if not exactly fresh. There’s no spin, no switcheroo—just old-fashioned creature and make-up effects and the bare minimum of backstory needed to motivate characters. Formerly titled The Station, the film is set around a remote Alpine research outpost besieged by mutated wildlife: giant ibexes, foxes with mandibles, killer woodlice, and insectoid birds of prey. (The sanguineous ice mass promised by the U.S. release title also makes an appearance.) Director Marvin Kren and screenwriter Benjamin Hessler seem like the kind of guys who’d pop in a Blu-ray of The Thing on a weeknight, and though they’ve clearly internalized much of the John Carpenter classic’s snowbound imagery, their film owes more to the simple, un-insidious scares of the drive-in creature feature. Blood Glacier’s monsters are the kind that break down the door, not the kind that scamper in the dark. If they’re never shown in full, it’s because that would involve showing the puppeteers who operate them. The movie’s requisite unlikely hero comes in form of Janek (Gerhard Liebmann), the outpost’s technician and resident drunkard. Janek is a mess; balding, with a hilltop forehead and a grizzly beard, he looks like a soup-kitchen Will Oldham. When it comes to characterization, though, the movie is nothing if not thrifty. Instead of providing Janek with a corny redemptive arc, his drinking serves only to streamline genre tropes. It gives him a reason to take the obligatory leak in the wilderness, and provides the outpost’s research team with grounds to mistrust his judgment and leadership skills. Not to say that there’s anything ingenious going on here. Quite the opposite; the lack of cleverness is part of the movie’s slight charm. When the researchers finally get their hands on a mutant, they explain away its existence with a stream of pseudo-scientific babble—something involving ancient microorganisms—which will bug the realism-minded and play like music for the genre faithful. Improbable conclusions are jumped to, and one-note characters are introduced in order to be killed off. It’s a movie viewers have seen dozens of times before, and will see again, with slight variations, because it embodies a fundamental quality of B-horror entertainment. True horror is primal, erasing the line between the characters’ experiences and the viewer’s, but B-horror runs on disbelief. The fun lies in identifying the tropes and recognizing that the monster is just latex and hair, then appreciating the rhythm and the puppetry anyway.